something fabulous out of an ordinary linen but it justified her huge linen stash! Now she had to make more of them! Cindy lives in Chico with her husband of 40+ years, Kent. They have two daughters, Jenny and Emily, and two grand-daughters, Chloe and Samantha. Cindy’s talk is “For the Love of Linens.” Cindy’s passion in quilting is turning ordinary antique linens into heirloom wholecloth quilts. Each quilt is one-of-a-kind, and each has a story to tell. During her sixty-minute trunk show she shares tips and techniques on how to create these amazing quilts as well as share their stories and inspiration. The quilts love to be fondled before and after the program! 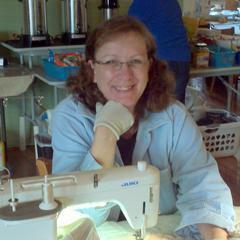 Cindy says she has been an obsessive quilter for over 45 years starting as a hand quilter when she was in the 8th grade. She loved the process of hand quilting but found she couldn't keep up with her quilt tops and finally had to learn to machine quilt. It was a very difficult journey, and not easy, but after many months of practice she finally got her rhythm and fell head over heels in love with the art of machine quilting. 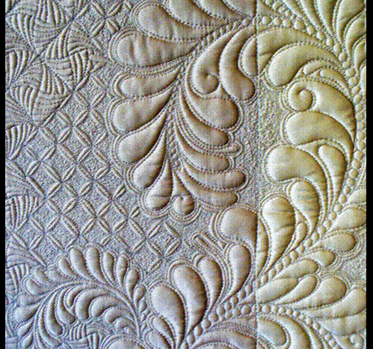 One of the best loved quilting designs of all times is the feather, and it seems to be one of the more difficult ones to beautifully quilt. Cindy LOVES to quilt feathers, and enjoys making them her own by adding special touches and details. She also enjoys filling her open space with beautifully detailed background designs. It’s usually a beautiful background that provides the “WOW” factor to a quilt. In this class you will learn how to create beautiful free form feathers as well as detailed backgrounds. You will also learn how to choose and use all different types of threads for your quilts. You will create a beautiful sampler on provided Cherrywood fabric while you learn all the new techniques.